There’s a widely understood thing, living in Nashville: You can’t walk six feet in this town without running into a world-class musician. The odds that your Saturday-morning barista spent Friday night on stage at the Opry, or the Ryman, or some other vaunted stage: high. One small down side: All that can make those of us who love music but never learned to play feel a little… intimidated by the idea of trying to explore it, in adulthood. If you weren’t learning to pick while still in Pampers, is there really any place for you in Nashville? Grown-up music learning with YEAH! YEAH! focuses on young folks in the Nashville area throughout the year, with events including the Southern Girls Rock Camp and Tennessee Teens Rock Camp. But those of us with musical inclinations and the ability to rent a car don’t get left out. 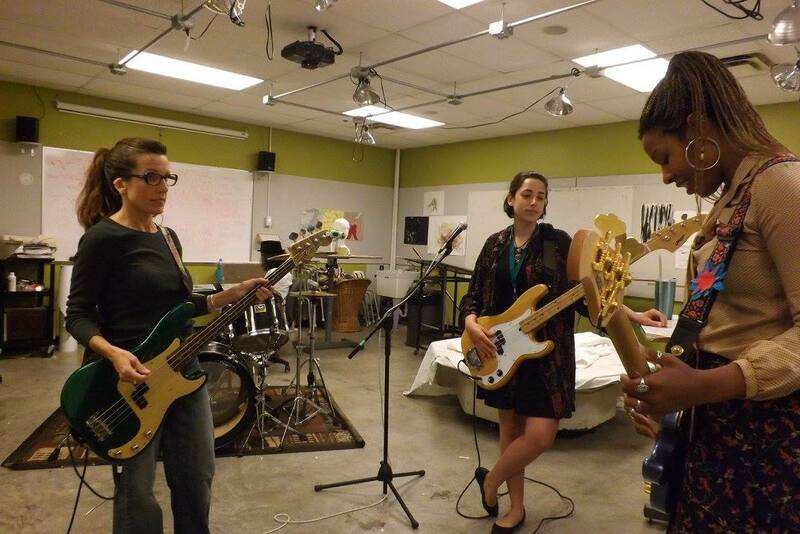 The Ladies Rock Camp, whose fall session runs Oct. 11-14 this year, is open to 18-and-up women of any musical ability, newbie to novice to intermediate player. Over the course of four days, you can dig into the basics of playing an instrument, the experience of starting a band, songwriting, performing and more. The approach is active and hands-on, with local musicians leading sessions and workshops, and the learning goes beyond just melody and rhythm, tackling subjects that loom large in the lives of many a creative Nashvillian, from feminism to social and racial justice. At the end of the session, every Rock Camper takes part in a showcase, too — so if you’ve never performed on stage in front of an audience, it’s a solid and supportive opportunity to give it a go. Maybe the best part of joining a Ladies Rock Camp session: The program tuition (which is pretty affordable, at $150 total) goes to fund the music education of young neighbors. All of the proceeds get funneled into YEAH!’s Scholarship Program, which helps kids who want to attend the Southern Girls and Tennessee Teens Rock Camps. Think you might want to take part, or just want to know more about the organization and camps? Head to southerngirlsrockcamp.com for more — you can register for the fall 2018 Ladies Rock Camp session there, and check out the ins and outs of the other camps, and YEAH!’s other local efforts. If you’re not looking to be a Camper, but do want to support what YEAH! does, you can subsidize some YEAH! campers through the site, too. And, if you’re not looking for education or instruction, but you are looking for a new Nashville home that offers space to practice, play and write, we can definitely help there. Take a look at some homes for sale in Nashville now, and reach ACRE here to tell us more about what you’re looking for!